Torino regained their place in the Serie B playoff positions after a hard fought draw away to Crotone. Torino. who are still without a win since the winter break gave new signing Mirco Antenucci a debut, as Franco Lerda's team lined up in an unfamiliar 4-3-1-2 formation. After an opening period in which both sides exchanged long ranged efforts, Crotone had an excellent opportunity to open the scoring from the penalty spot, after Paulo Zanetti was harshly penalised for handball mid way through the second half. However, Torino goalkeeper Davide Bassi made a magnificent save as he dived low to his right to save Ciro Ginestra's spot kick. Despite Bassi's heroics, Torino found themselves 1-0 down ten minutes later, after an outstanding curling shot from 20 yards by Aniello Cutolo. Toro levelled soon afterwards though, as they did in the recent away game at Padova, and once again it was Rolando Bianchi who got the breakthrough. Bianchi scored after Crotone goalkeeper Vid Belec was only able to parry Antenucci's shot, and Bianchi was there to capitalise. In fact, Rolando Bianchi is the only Torino player to score in 2011, and this is an issue coach Franco Lerda will be keen to address, and once again it emphasises how important the former Manchester City striker is to the team. The game finished with the points shared, and Paulo Zanetti's afternoon got worse after he received a second yellow card for dissent after the final whistle, with the midfielder still infuriated by the referee's decision to award Crotone a penalty. Torino have today announced a swap deal with fellow Serie B club Livorno, with Torino midfielder Luca Belingheri signing for the Tuscan club. In exchange, Torino have acquired midfielder Biagio Pagano from Livorno on a contract until June 30th, 2013. The former Rimini player has already scored three goals this season, and will hopefully be able to replicate that goal scoring midfield for the Turin club. Torino embark on the long 1,265 kilometre journey to Crotone for their next Serie B fixture on Saturday afternoon. The trip to coach Franco Lerda's former club is an important one for the Granata as they attempt to get their promotion hopes back on track. Lerda has suggested that Torino will alter their tactics for the match, with the arrival of Mirco Antenucci making a 4-4-2 formation more likely, instead of Lerda's traditional 4-2-3-1 setup. Toro's other new signing Denilson Gabionetta is not included in the squad, as the Brazilian is still a few weeks away from match fitness. Crotone, now being managed by ex Torino midfielder Eugenio Corini currently occupy 12th position, and a victory over Torino could propel up the table and be seen as genuine playoff contenders. 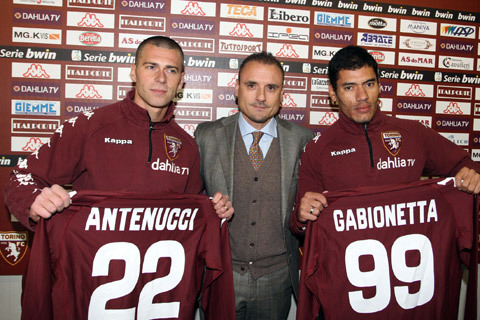 Torino have confirmed the signings of striker Mirco Antenucci and the Brazillian attacking midfielder Denilson Gabionetta, in a busy couple of days for the club. Antenucci joins from Catania and Torino fans will certainly be hoping he is able to replicate the form he showed on loan at Ascoli last season in Serie B, when he scored an impressive tally of 24 goals. ﻿Torino have also announced that they have terminated the contract by mutual consent of Austrian midfielder Jurgen Säumel. Torino still find themselves without a win in 2011, after a draw against relegation threatened Cittadella. The Granata had an excellent start to the game with Rolando Bianchi once again stressing how important he is to the team, giving them the lead after 26 minutes, albeit from just one yard out after Andrea Gasbarroni's pass. However, despite dominating the first half, Torino were unable to score a second goal, and were made to pay when substitute Danilo D'Ambrosio somehow diverted a goal bound effort past Davide Bassi in goal. Torino's failure to hold on to the three points means that they stay outside of the playoff zone, on goal difference, level on points with both Livorno and Reggina. After the disappointing defeat away to Varese, Torino must pick themselves up for their first home game of 2011, against lowly Cittadella. Although it is perhaps to soon to describe this game as 'must win', three points would be extremely welcome for Torino, who find themselves out of the playoff positions, after Reggina's draw on Monday. The Torino hierarchy have perhaps sensed how important a game this is, and have introduced an initiative that allows women to purchase a ticket for just two euros, and under 16's can buy a ticket for just one euro. With teams throughout Italy struggling to fill their stadiums, Torino should certainly be praised for these reduced ticket prices, and it will hopefully increase the atmosphere at the stadium, and encourage the team to a much needed victory. Cittadella have not enjoyed the same success this campaign as they did last season, and currently occupy 16th position, and find themselves in a relegation battle, meaning they will be just as desperate for the points. Torino's hopes of achieving automatic promotion were dealt a huge blow, as they succumbed to a disappointing 3-0 defeat to newly promoted Varese. Whilst this result still keeps Toro in the top six, and therefore still in the playoff positions, they now find themselves ten points away from Novara, Siena and Atalanta who are tied at the top of the table with 43 points. However on this evidence Torino will need to improve drastically in order to keep their hopes of promotion alive, which may lead to more signings in this January transfer window. Torino held their own in the first 45 minutes, with Alessandro Sgrigna forcing the Varese goalkeeper into a good save, however in injury time of the first period, Varese took the lead. After hesitant defending by the away side, Alessandro Frara unleashed a fierce left footed shot into the net. Just three minutes after the restart, and once again Torino conceded from a set piece, with Claiton dos Santos making it 2-0. Alessandro Budel came off the bench as Toro endeavoured to find a way back into the match, however this left spaces in the defence, allowing substitute Fabio Concas to complete the scoring. Things got worse for Torino as midfielder Daniele De Vezze was sent off for two yellow cards late on. Torino will be looking to gain revenge today for the 2-1 home defeat they suffered at the hands of newly promoted Varese on the opening day of the season. Whilst Torino have certainly improved since the start of the season, the game will definitely be a difficult one, as Varese occupy 4th position in the table, and are unbeaten at home, with five wins, and five draws from their ten home games. The game will be played at Stadio Franco Ossola, named after the Varese born ex Torino player who was a member of the 'Il Grande Torino' team, and tragically died in the 1949 Superga Air Disaster. Torino made their first signing of the January transfer window on Friday, with the acquisition of experienced midfielder Alessandro Budel. Budel has already achieved promotion from Serie B with both Parma, and last season with Brescia, and will be hoping for similar success with Torino this season. 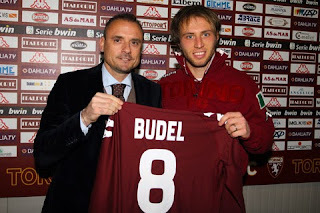 Budel will wear the number 8 shirt, and should be available for today's game against Varese. In Torino's first game of 2011, they were thankful to the man who scored so many goals for the team in 2010, Rolando Bianchi. Bianchi's outstanding lob with just 15 minutes remaining rescued a point for the Granata, and kept them in the all important Serie B playoff positions. Whilst the first half was a largely forgettable affair, the game livened up in the second period, as defender Elia Legati gave Padova the lead after sloppy Torino defending from a corner. However, the home side were unable to hold on, as Bianchi scored a deserved equaliser just 6 minutes later, to give both sides a share of the spoils.